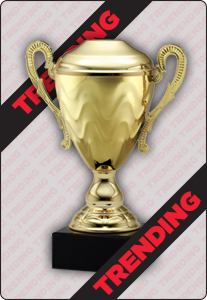 This gold and black trophy design features a large football between goal posts, in a circular frame, with stars. This trophy represents a love of football, and will stand pride of place in any keen player’s trophy cabinet. Make this trophy extra special with an engraved message – add player names, date and event attended, an encouraging quote or other note.